Don't you hate it when you see an unwanted spot on your face, especially if it's a couple of nights before a Shoot, Date or Work. I'm such a girly girl, I adore Make-Up! I know it's not always great for the skin so that is why it's very important to look after it by cleansing and moisturising everyday, I recommend using the Edelweiss range. However even though we stick to our Skin Care routine, there will always be that unwanted spot appearing from time to time. I usually use Sudocrem for spot treatment, but this can rub off while sleeping and gets messy which is annoying. So what else can I use? I came across Dream Dots on Twitter and was eager to try their product, they kindly sent me a box of 24 dots to try. This overnight treatment is an amazing little patch that heals the spot and reduces redness quickly. It's not messy or irritating and I can't feel it on my face! 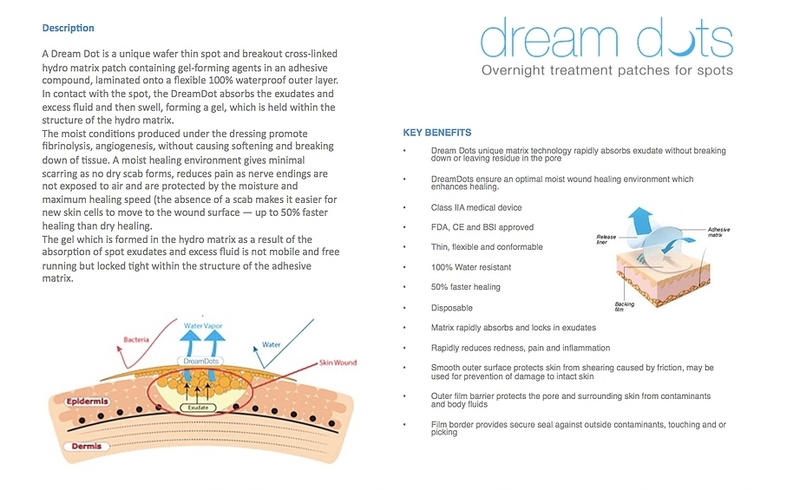 I applied a dream dot to a spot that came up and after only one night it was clearly working, After a few nights of using the Dream Dot my spot had disappeared completely! Using a Dream Dot is super easy! 1. Cleanse your face and then make sure it's dry. 2. Tear off a Dream Dot Patch. 3. Remove half of the Dream Dot backing paper. 4. Place the centre of the Dream Dot to the area needing treatment. 5. Remove the rest of the backing paper. 6. Press the Dream Dot down for 3 seconds and leave on for 8-12 hours. It's unbelievable that this tiny Dream Dot can actually get rid of your spots and breakouts. I also like the fact that it's hardly noticeable, although the patch does turn white towards the end of the treatment. Dream Dots are based in Ireland, €14.95 (£11.95) for 24 dots and €24.95 (£19.95) for 48 dots, They also ship worldwide for free! Ooh, they sound fab! Might have to invest in some when I get paid next!